A fraternal organization of law enforcement officers with a membership of over 20,000+, making up 637 chapters based in 29 counties worldwide. All members share the bond of law enforcement and a love of motorcycle riding. Among the Blue Knights there are no strangers, only friends we haven't met yet. A member of the Great Lakes Regional Conference, WI. 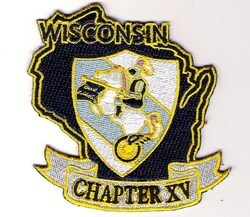 BK-XV was conceived in 1995 by a few stalwart officers from Wood Co. Sheriff Dept. and the Wisconsin Rapids Police Dept. In 1996 we received our charter from the International. Membership has fluctuated through the years, from the original 10 to as many as 46 and back to our present membership of 24. Our geographical area is quite large covering the central and north central part of the state. Our membership consists of active duty and retired officers from city, county, and state agencies. We support several area charities, food pantries and strongly support our military veterans. As a group and individually our goal is to promote a positive image of motorcycling to our local communities and the general public. Our family and friends take part in many of the club sponsored activities such a rides, picnics, summer camp outs, and off season gatherings. We enjoy life and our passion for riding only enhances the enjoyment. We care not what style or brand of bike you ride, only that you ride in a safe and courteous manner. When you find yourself in our area look us up, the coffee pot is always on and there is something cold in the fridge.